Plant some seeds of wisdom in your children’s fertile imagination with this clever set of 15 illustrated bookmarks! Each set contains an assortment of 5 different 3" x 8" designs. The bookmarks are printed on durable white cardstock in black ink and are meant to be colored with crayons, colored pencils, or markers. Use them as rewards, or have your children color, laminate and give them as gifts! 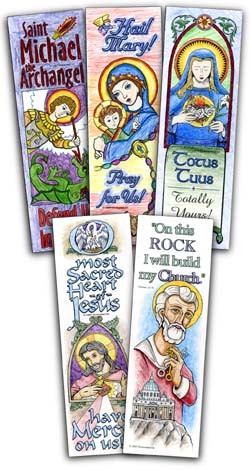 "I use these cards in our prize box at my religious instruction class (1st grade this year). Students can select from this box if they correctly answer one of the review questions at the end of class. The book marks have been very popular with students wanting to collect one of each." "They were really cool! They make great bookmarks because they are big so they won't fall out of your book and you can color them any way you want too. They also make great gifts! I love to color them and them give them away. Once I gave one to my grandfather who reads everyday and he loved it! So now when he opens his book he can think of me. I think they are really fun, easy to do,they turn out beautiful when your all done, and make great bookmarks!!" "These are fantastic! Our daughter recieved them as a gift on her First Communion, and they were a huge hit. She loved coloring them and was able to understand and appreciate the message of each!"